There are several salads that are either served with main course dishes or eaten alone. But then, you will also find dishes that can be served as starters or as parts of special weekend lunch. 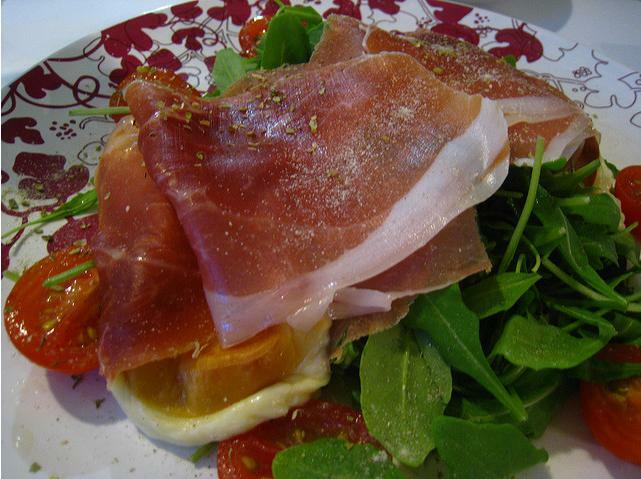 If you are looking for such a salad, then Rocket and Parma Ham Salad is an ideal affair that meets your expectations. This is because of two reasons; one it can be prepared without consuming much time and secondly Rocket and Parma Ham Salad is filling and delicious at the same the time. In brief, it has a simple recipe that not only looks great on the dining table but is quite healthy as well, and you can easily make it a part of your elegant dinner or special lunch. The great thing about this salad is that it can be easily prepared as it does not require any special cooking skills and the recipe of this salad is quite easy too. However, if you do not know how to make it then take help from this guide and prepare an appetizing, beautiful and filling platter of this salad for yourself or your friends or family members. To make Rocket and Parma Ham Salad, take 1 large bag rocket and arrange it on a serving platter. Then grab 1 (200g) packet of Parma ham and tear it into thin narrow pieces. After that set it in a serving platter over the top of the rocket. Now drizzle 4 tablespoons olive oil and 4 tablespoons balsamic vinegar over Parma ham and rocket after which this salad is ready and you can serve it immediately.